*Teams are identified as 3 or more people from your organization. Teams of more than 5 should contact Jamie Jaegers at 443-543-5628 or jamiej1@umbc.edu to register. **Alumni are identified as individuals who have completed the Erickson School’s Management of Aging Services undergraduate and/or graduate degree programs. Use the buttons below to register now! Please contact Jamie Jaegers at 443-543-5628 if you missed the registration deadline and are still interested in attending the 2018 Memory Care Summit. Cancellations must be received 14 business days prior (JAN 1) to the Summit start date for a full refund, minus a $100.00 processing fee. Cancellations received after that time are not eligible for refund. Discover the casual elegance of this charming, New England-style Resort hotel while staying at Disney’s deluxe resort, The Beach Club. Savor exquisite dining, and explore the pools, lagoons, and spas of Stormalong Bay. Sail around Crescent Lake on a rented mini-powerboat, and experience the luxurious comfort of a Club Level Suite. Sharing many amenities with its more formal sister, Disney’s Yacht Club Resort, Disney’s Beach Club Resort is walking distance to Epcot and a convenient boat ride to Disney’s Hollywood Studios and Disney’s Boardwalk shops and restaurants. Rates starting at $273/night based upon style and preferences. 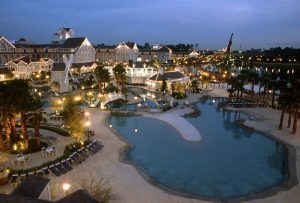 Book your hotel room at Disney’s Beach Club Resort today before discounted room blocks sell out. Reservations must be made no later than December 22, 2018 to receive this rate. *Note: There is a considerable amount of walking when staying at any Disney resort. The average walk from our rooms to the conference space is about 10-15 minutes. If you require special assistance or have mobility issues, please contact Jamie Jaegers (jamiej1@umbc.edu) before January 1, 2019 for special accommodations and scooter/wheelchair rentals.